Habit: Annual, perennial herb [to shrub, soft-wooded tree], hairs stinging and not [glabrous]; monoecious or dioecious; wind-pollinated. Leaf: alternate or opposite, generally stipuled, petioled, blade often with translucent, raised dots due to crystals in epidermal cells. Inflorescence: axillary, 1-flowered or head-, raceme-, or panicle-like. Flower: generally unisexual, small, +- green; sepals generally 4--5, free to fused; petals 0. Staminate Flower: stamens generally 4--5, opposite sepals, incurved in bud, reflexing suddenly when flower opens. Pistillate Flower: ovary 1, superior, chamber 1, style 0--1, stigma 1, generally hair-tufted. Fruit: generally achene. Genera In Family: 50 genera, 700 species: worldwide; some cultivated (Boehmeria, ramie; Pilea, clearweed). Habit: Annual, perennial herb [to shrub], weak, stinging hairs 0 or few to many; monoecious or dioecious. Stem: branched or not, erect, spreading, or decumbent. Leaf: opposite, lanceolate to cordate, toothed, prominently 3--5-veined from base; crystals round to elongate. Inflorescence: head-, raceme-, or panicle-like. Staminate Flower: sepals 4, +- free, green, sharp-bristly; stamens 4. Pistillate Flower: sepals 4, +- free, outer 2 < inner 2. Fruit: lenticular to deltate, enclosed by 2 inner sepals. Habit: Perennial herb 5--30 dm, from rhizome, +- erect, stinging hairs few to many, non-stinging 0 to dense, generally shorter. Leaf: blade 6--20 cm, narrow-lanceolate to wide-ovate, base tapered to cordate. Inflorescence: spike-, raceme-, or panicle-like, 1--7 cm, generally > petiole, of staminate or pistillate flowers. Fruit: ovate. Note: Urtica dioica subsp. dioica dioecious, native to Eurasia; naturalized in North America; report from California in FNANM based on an unconfirmed collection. Habit: Generally monoecious. Stem: 10--30 dm. Leaf: narrow-lanceolate to wide-ovate. Chromosomes: 2n=26. Ecology: Meadows, seeps, springs, margins of marshes, streams, lakes, moist areas in chaparral, coastal scrub; Elevation: < 3370 m. Bioregional Distribution: CA-FP (exc but expected NCo, SNF), GB, DMoj (uncommon); Distribution Outside California: western United States, northern Mexico. Flowering Time: Jun--Sep Note: Plants in shade tend to have wider leaves, fewer hairs, so approach Urtica dioica subsp. gracilis. 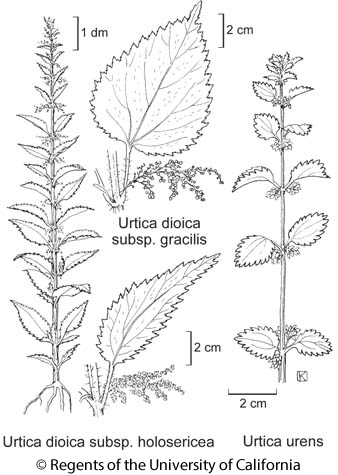 Citation for this treatment: Robert E. Preston & Dennis W. Woodland 2012, Urtica dioica subsp. holosericea, in Jepson Flora Project (eds.) Jepson eFlora, http://ucjeps.berkeley.edu/eflora/eflora_display.php?tid=53303, accessed on April 19, 2019. CA-FP (exc but expected NCo, SNF), GB, DMoj (uncommon); Markers link to CCH specimen records. Yellow markers indicate records that may provide evidence for eFlora range revision or may have georeferencing or identification issues. Purple markers indicate specimens collected from a garden, greenhouse, or other non-wild location.